The illegal immigration of non-Western peoples, I predict, will become an all-consuming issue in every Western country. As Western birth rates plummet, as communication and transportation networks improve, and as radical Islam increasingly rears its aggressive head, Europeans, Americans, and others worry about their economic standards and the continuity of their cultures. After ignoring this issue for decades, reactions in Europe especially have sharpened of late. The French lower house of parliament passed a tough new immigration law. Austria's interior minister, Liese Prokop, has asserted publicly that 45% of her country's Muslim immigrants "cannot be integrated," and admonished them to "choose another country" in which to live. The Dutch minister of immigration, Rita Verdonk, has withdrawn citizenship from Ayaan Hirsi Ali, a Muslim-born immigrant who became renowned as a critic of Islam. But the most dramatic, agonizing, and consequential developments for immigration to the West are taking place along the remote west coast of Africa. The area has emerged as a main springboard for would-be emigrants to access the riches of Spain and then all Europe. West Africa's role is a new one. Until late 2005, emigrants gravitated to Morocco, in part because, separated by the Straits of Gibraltar, it is a mere eight miles away from Europe. Also, they could easily sneak into the Spanish enclaves of Ceuta and Melilla. At worst, they could reach the Canary Islands, a Spanish territory 70 miles off the coast of West Africa. All of these served equally well as a gateway to all of Europe. But no longer: Under intense Spanish and EU pressure, Moroccan authorities cracked down hard on illegals to the point of dumping them without provisions in the desert. The same forbidding inhospitality reigns in the Western Sahara, a territory to Morocco's south fully under its control. Meanwhile, the European Maritime Border Guard Corps patrols the Mediterranean Sea with increasing efficiency. That made Mauritania, south of the Moroccan-ruled areas and one of the poorest, most isolated countries in the world, the new transit point of choice. Africans and other would-be European migrants, especially South Asians, began turning up in large numbers. Nuadibu (population: 90,000) found itself hosting more than 10,000 transients in early 2006. Under pressure from Spain, the Mauritanians also cracked down. Ever resourceful, migrants repaired farther south, now to Senegal. The Canaries run takes less than a day from Morocco but three days from Mauritania and seven to 10 days from Senegal. Notoriously rough seas off West Africa can easily overwhelm the open wooden fishing boats and their single outboard engines as they cover the 900 miles. The Spanish ambassador-at-large for humanitarian issues, Manuel Pombo, has reported that up to 40% of those attempting to reach the Canaries die en route. The head of the Red Crescent in Mauritania, Ahmedou Ould Haye, has called it "collective suicide." Another observer sadly predicted, "Three months or so later, some of these sorry vessels may creep into the Caribbean – as ghost ships, or worse." Would-be African immigrants arrive on a boat on May 18 at the port of Los Cristianos, Tenerife, Canary Islands. These gruesome odds notwithstanding, the waves of immigration keep growing, in large part because once they land on Spanish territory, their reception is so accommodating and few illegals are ever deported. (A head of emergency services in the Canaries, Gerardo Garcia, has compared landing there to going on holiday.) On May 18, a record 656 people landed in the Canaries, or one-seventh of the total number of arrivals in all of 2005. "It is almost like an invasion," a volunteer in the Canaries lamented, Agence France-Presse reported. Hoping to stem the immigration tide at its source through deportation agreements, Spanish diplomatic delegations offer West African countries financial aid in exchange. But African governments resist this, appreciating the remittances from Europe as much as they dislike the bad publicity of large-scale expulsions. These palliatives cannot possibly solve the tensions as have-nots try to crash the haves' party. Rickard Sandell of the Royal Elcano Institute in Madrid has predicted that the migration now under way could signal the prospect of an African "mass exodus" and armed conflict. What one sees today "is only the beginning of an immigration phenomenon that could evolve into one of the largest in history. … the mass assault on Spain's African border may just be a first warning of what to expect of the future." Thus begins the first chapter of what promises to be a long and terrible story. May 30, 2006 update: (1) The above article builds on a weblog entry, "West Africa - Europe's New Border," that I have been keeping since March 19, 2006. Check it for continuous updates. "Immigration's Grisly Edge in Ceuta and Melilla." October 19, 2003. "Malta – Another European Outpost under Seige." June 4, 2006. The story of the 11 dead and some 40 other would-be immigrants from Guinea Bissau, Senegal and Gambia starts on Christmas Day last year at Praia, a port in the former Portuguese colony of Cape Verde. There, for 1,300 (£890) each, they were promised a trip to the Canary Islands by a mysterious Spaniard. Their boat was to be a motorised yacht, recently repaired but bearing no name and no flag. They paid to make the voyage, assuming that the Spaniard - a mechanic based in the Canaries - would be skippering the boat. At the last moment, however, a Senegalese man took over and the Spaniard disappeared. Several then refused to make the journey. One, according to the El Pais newspaper yesterday, jumped from the yacht as it set sail. It is by no means clear what happened next. Police and forensic experts inspect a boat in Bridgetown, Barbados, where 11 bodies were found in the cabin of the unnamed 20-foot boat. Somewhere near the Mauritanian port of Nouadhibou the yacht ran into trouble. Another boat was sent to its aid, apparently after the skipper had contacted the Spaniard. The yacht was towed but, at some stage, the line was severed. El Pais reported that it had been hacked with a machete. With no fuel left and food and water running out, the migrants' fate was left in the hands of the sea, the weather, and luck. The latter soon ran out. The yacht drifted into the stormy Atlantic and, it is assumed, people were tossed or washed overboard as they died. The 11 last survivors, huddled together against the elements, were reported to have died by the end of January. At that stage their yacht became a ghost ship, battered by storms or winds until it appeared, 2,800 miles away, on the other side of the Atlantic. 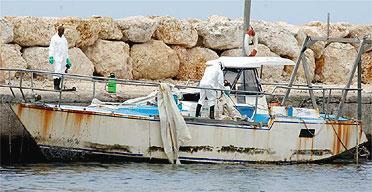 A Barbados fishing boat was the first to sight it on April 29, 135 days after it had set sail. Related Topics: Immigration, Muslims in Europe | Daniel Pipes receive the latest by email: subscribe to the free mef mailing list This text may be reposted or forwarded so long as it is presented as an integral whole with complete and accurate information provided about its author, date, place of publication, and original URL.